By the end of the day on Oct. 27, 2005, Construction Equipment's editorial staff collectively reached this conclusion: The rubber-tracked mini skid-steer loader, despite its small size, is a serious construction machine that is sure to find wider application as contractors continue to discover its unique capabilities. We base our opinion on observations during a two-day, in-the-dirt evaluation of seven of these diminutive workhorses, all top-of-the-line models with familiar brand names: Bobcat, Boxer, Dingo, Ditch Witch, Ramrod, Thomas and Vermeer. 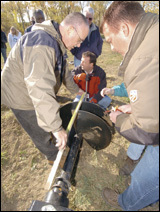 We called the event "Mini-Skid Workdays," and asked these seven manufacturers — Bobcat, Compact Power (Boxer), Toro (Dingo), Ditch Witch, Leon's Manufacturing (Ramrod), Thomas and Vermeer — to come to Illinois with their largest machine, along with its standard dirt bucket, a 24-inch trencher and a 30-inch-diameter auger. And they all came, convening on an 80-acre site in Plainfield, Ill., some 30 miles southwest of Chicago. If you're a regular CE reader, you may recognize the site as Local 150's (International Union of Operating Engineers) Apprenticeship and Skill Improvement (ASIP) facility, where IUOE members are trained as operators and service technicians. Construction Equipment is greatly indebted to Local 150's staff for sharing its facility, its resources and its expertise to assist with this project. Our thanks go, also, to the manufacturers who participated in the event. CE's purpose in bringing the seven machines and their manufacturers together on Oct. 26 and 27 was to collect information that would provide potential buyers a close look at what CE's staff considers a significant emerging equipment category, which is presently identified with various labels, including mini skid-steer loaders, mini track loaders, compact skid-steer loaders, compact utility loaders or just "mini-skids." Bringing the major players together gave us the opportunity to review each machine's basic design and features, as well as to determine, in average terms, the kind of performance you might reasonably expect from these machines. Of course, the mini-skid, like its larger skid-steer-loader or compact-track-loader counterparts, is, at heart, a "tool carrier," and we were impressed by the broad selection of attachments offered for these machines. That selection may include specialty buckets, pallet forks, grapple forks, hydraulic breakers, backfill blades, trenchers, augers, rotary brooms, stump grinders, vibratory plows, concrete-mixing barrels, rippers, ground-conditioning tools, snow throwers and backhoes. Attempting to give you an idea of how the mini-skid might handle each of these attachments would be an impractical task, so we selected the three basic tools noted above for evaluation. To investigate the work capabilities of these machines with the selected tools, we kept records as two Local 150 instructor/operators put the machines to work in three specific applications.Mini-Skid WorkdaysAs the mini-skids arrived at the ASIP facility, Local 150 instructor/technicians Jim Yasko and Rick Bewsey checked each machine's high-idle speed and auxiliary-hydraulic pressure against specifications. Then, on Wednesday morning, Oct. 26, we began the Mini-Skid Workdays event day with brief walk-around presentations, in which each manufacturer informed "the buyer" (the CE editorial staff) about the machine's salient features. At the first worksite, Local 150 operator/instructors Tom Rush and Martin Turek used each machine in a load-and-carry application. We'd erected an 80-foot × 40-foot tent at the site, thinking that even if it rained, the event could go on as scheduled. But the day was dry and bright, so the operators loaded crushed limestone from a stockpile just outside one end of the tent, traveled outdoors along the 80-foot side, maneuvered up a 25-foot ramp just outside the other end of the tent, dumped into a waiting truck and returned to the stockpile. The first operator made four cycles with a particular machine, followed by the second operator, who duplicated the process. We timed the operators as they worked, then weighed the truck on electronic scale pads to determine its payload. At the next worksite, we traded the buckets for trenchers and asked each operator to use each machine to open 10 linear feet of trench, at an approximate 2-foot depth. The soil was well-compacted, clean fill having a fair amount of clay and a few rocks. Because some of the machines had trencher attachments with booms in excess of 24 inches, we asked Doug Amerman, director of OEM sales for Paladin Light Construction, to help us uniformly establish a 24-inch cut for each machine before it began its trenching runs. With the mini-skids so positioned, we placed a stake adjacent to a forward reference point on each machine, measured back 10 feet and set a second stake, then measured off another 10 feet and set a third. When the reference point on the machine indexed with the second stake, the first operator stopped, and the second then opened another 10 feet of trench. We timed the operators as they worked, then measured each trench at several points to establish an average depth and average width, which we used to calculate the volume of earth excavated. Most of the trencher chains used a combination of shark teeth and cup cutters, but not all. For the third evaluation, boring, we moved back a bit from the trenching site and asked each operator to use each machine to drill a 36-inch-deep hole with a 30-inch-diameter auger. To set up this evaluation, we placed each machine's auger horizontally on the ground, measured back from the tip 36 inches, then used a level as a straightedge to transfer that point to the auger shank, which we marked with tape. Our method was to start the watch when the auger began to spin, then to stop timing when the tape disappeared into the spoil. In a typical CE field test, the machines involved are worked until all concerned are satisfied that data samples have stabilized and that sufficient samples have been collected to provide a valid look at machine performance. With the mini-skid evaluation, however, given the number of machines involved and practical time constraints, we could observe a specific machine's capabilities only for a short time and under a particular set of conditions. Of course, we designed the tests to eliminate as many variables as possible — for example, loading crushed limestone, instead of soil, which could vary in moisture content and degree of compaction. But when all was said and done, we looked at the numbers for individual machine performance and concluded, in fairness to all concerned, including potential buyers, that the production samples were too small to use as a basis for confidently projecting a specific machine's capabilities in a given application. But, that said, we further reasoned that with a broad range of such samples — we now had seven sets of production numbers, one from each machine — uncontrollable variables (different soil conditions when trenching, for instance, or cycle-to-cycle variation in bucket-fill ratios or encountering rocks when boring) would tend to even out over the wider sample base. Thus, we concluded that we could, without too seriously mangling the laws of statistics, legitimately average the samples to project typical performance for the group of mini-skids in the specific applications involved. These numbers, we trust, will give you at least a glimpse into the work potential of the mini-skid, and may help you decide whether a mini-skid would benefit your operation. If you consider the mini-skid a potentially valuable addition to your fleet, then you have an expanding number of choices to investigate. The seven manufacturers at our event, for example, collectively have 19 models of rubber-tracked mini-skids, many diesel-powered, and most running with surprisingly generous auxiliary flows and pressures. Among the seven units on our site, six were diesel-powered, five had an integral ride-on platform, one used an optional trailing platform and one was a walk-behind. List prices with a bucket ranged from $17,500 to $24,000. And we were impressed, as you might be, with the different approaches manufacturers have taken in the design of their machines — especially in the areas of hydraulics, controls and undercarriage configuration. The basic design of these machines, of course, is similar to that of a conventional skid-steer loader (closer, actually, to a compact track loader) in that the engine is essentially a means for driving hydraulic pumps. The pumps, in turn, create the oil flow to perform several functions: turn the hydraulic drive motors at the sprockets, which power the tracks; activate the boom and bucket cylinders; and power hydraulically driven attachments (such as trenchers and augers) via an auxiliary-hydraulic system. Hydraulic-flow rates in the auxiliary circuits of the machines we had on site ranged from 11.2 to 14 gpm, and relief pressures were between 2,900 and 3,000 psi. These combinations of flow and pressure produce considerable hydraulic horsepower, thus giving the mini-skid the capacity to competently handle an increasing array of powered attachments, which are quickly attached via a cam-type or "universal-type" coupler. We were also impressed with the capability of their auxiliary-hydraulic systems, which rival those of small, conventional skid-steer loaders. When we saw the size of the 30-inch-diameter augers that manufacturers brought to the event, for example, our first thought was that these small units would struggle with these large tools. Not so; every one of the machines capably handled the assignment. And with their trencher attachments, the mini-skids proved their mettle as potentially very valuable machines in such varied applications as curb-to-house utility installations, drainage projects or small-structure footings. Judging from the competent manner in which these units excavated a 2-foot-deep trench, we'd guess that they could dig considerably deeper with absolutely no problem. And, too, we were impressed with the mechanical and hydraulic sophistication of these machines. Their engines, for instance, whether gas or diesel, reflected efficient, durable designs — as did the range of hydraulic pumps and motors (and hydraulic controls) employed. In general, we noted extraordinary attention to detail that one might not expect in machines of this size. Added to that is an evident emphasis on safety of operation, with various operator-presence and lockout devices to help keep operators from harm's way. On average, based on the list prices furnished by the manufacturers, you can expect to pay around $20,000 list for a mini-skid, a price that usually includes a basic dirt bucket. Your total investment, of course, will vary with the specific attachments chosen. But, that said, we think an investment in a rubber-tracked mini skid-steer loader may pay dividends in any operation that could benefit from a serious machine that can handle a wide range of utility chores — especially when confined or weight-sensitive work areas are an issue. The Thomas 35DT begins its first trenching run as Thomas' Michael Twumasi-Boateng and CE's Katie Weiler start their watches. Local 150 operator/ instructor Marty Turek assists operator/instructor Tom Rush (at the controls) in keeping the auger plumb during the evaluation. Setting up the augers for the evaluation took far longer than actually boring the holes. We were impressed with the power the mini-skids demonstrated in handling these big tools. 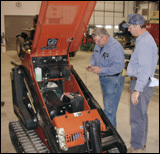 Local 150 instructor/ technicians, Rick Bewsey, left, and Jim Yasko, check the high-idle and auxiliary-hydraulic pressure specifications on the Ditch Witch SK650. In the load-and-carry evaluation, the machines loaded from a stockpile of crushed limestone that weighed 2,600 pounds per cubic yard (Boxer 237), carried the load approximately 125 feet (Toro Dingo TX 425), ending at the top of a ramp and dumping into a single-axle truck (Bobcat MT55). Cycle time includes return to the stockpile. 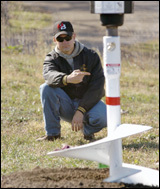 The truck was weighed on electronic scale pads to determine payload. Local 150 operator/instructor Tom Rush is shown at the controls of the example machines. Our photographer, George Pfoertner, captured serious faces as (right to left) CE's Katie Weiler, Leon's Manufacturing's Dwight Turta, and CE's editor-in-chief, Rod Sutton, time Local 150's Marty Turek as he makes a trenching run with the Ramrod 1150. Local 150's Tom Rush (top image, in red hat) attracts a crowd as he uses the Vermeer S600TX with its 30-inch-diameter auger. Actually, so did Local 150's Marty Turek (above) with the Ditch Witch SK650; the crowd is just out of the frame.